For the last few weeks I have been itching to place an order with Sephora. I ultimately only ended up buying three things from the store in Florida in May after spending about an hour and a half being totally overwhelmed by the choice. So naturally I regret not popping a few more items into my basket while there. 1. Sephora Cream Lip Stain in Endless Purple. I have heard nothing short of brilliant reviews of these liquid lipsticks and I'm dying to try them. Endless Purple looks like a beautiful Autumn/Winter shade that, let's be honest, I'd probably wear all year round. 2. Kat Von D Tattoo Liner. Again, reviews on this have been great and, as eyeliner is a staple in my everyday makeup, the longevity and precise nib make this just what I need. 3. Bite Beauty High Pigment Pencil. I first read about these on Coco's blog and unfortunately she makes me want pretty much everything she reviews. Coco featured the shade Zinfandel however I've been looking at two other shades, Rhubarb and Tannin - I can't decide which I like better! 4. Tarte Lights, Camera, Flashes Mascara. I'm not the biggest mascara person and I tend to just use whatever I have on me at the time, but this seems to be well received and I'm tempted to give it a try. 5. 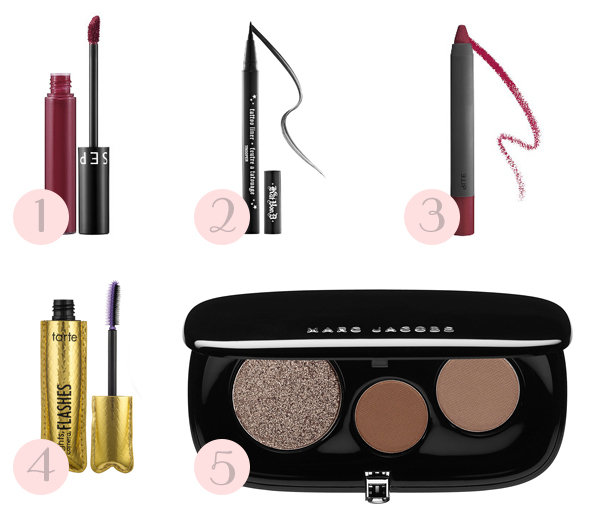 Marc Jacobs Style Eye-Con Eyeshadows. Rather than looking at the larger palettes, I think the 3 pan palettes by Marc Jacobs are lovely and a really great size to carry around. It's pricey, but if you can't treat yourself on your birthday then when can you? Do you have anything from Sephora on your wishlist? I wish that there was a sephora here in the UK as they seem like they have so many great stuff. I really like the looks of the Marc Jacobs palette, the shades are just gorgeous. Thank you for sharing your wishlist ^^ Its ok to treat yourself as its your birthday soon! That Marc Jacobs plaette is seriously screaming my name! I just haven't been brave enough to go through with the purchase and I don't even know why. My wishlist looks really similar with you, excpet throw in 2343345 things more and you're there. hah! I have quite a few things there for the Christmas season! I'm definitely agreeing with all of these products! That Marc Jacobs palette is so, so stunning.